This false color image of Saturn's moon Mimas reveals variation in either the composition or texture across its surface. This image is a color composite of narrow-angle ultraviolet, green, infrared and clear filter images, which have been specially processed to accentuate subtle changes in the spectral properties of Mimas' surface materials. To create this view, three color images (ultraviolet, green and infrared) were combined with a single black and white picture that isolates and maps regional color differences to create the final product. 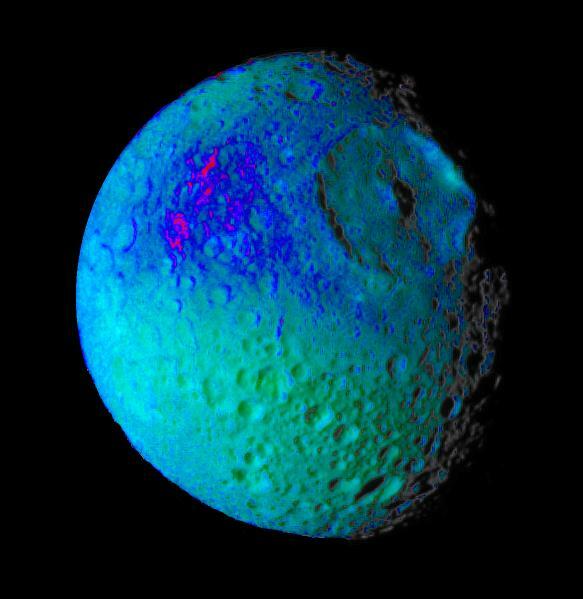 Shades of blue and violet in the image at the right are used to identify surface materials that are bluer in color and have a weaker infrared brightness than average Mimas materials, which are represented by green. Herschel crater, a 140-kilometer-wide (88-mile) impact feature with a prominent central peak, is visible in the upper right of the image. The unusual bluer materials are seen to broadly surround Herschel crater. However, the bluer material is not uniformly distributed in and around the crater. Instead, it appears to be concentrated on the outside of the crater and more to the west than to the north or south. The origin of the color differences is not yet understood. It may represent ejecta material that was excavated from inside Mimas when the Herschel impact occurred. The bluer color of these materials may be caused by subtle differences in the surface composition or the sizes of grains making up the icy soil.